The newly redesigned IDEA website. 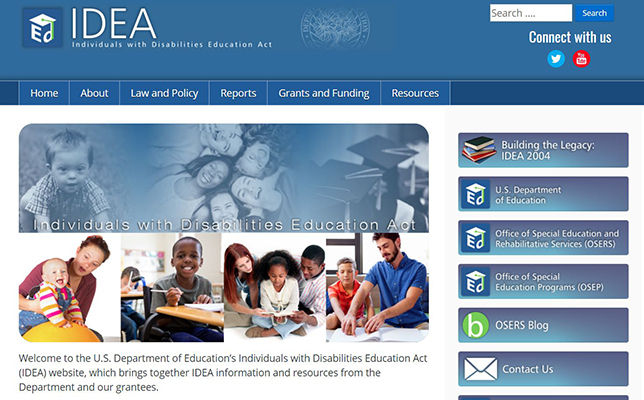 Feedback is trickling in on the U.S. Department of Education's new website dedicated to the Individuals with Disabilities Education Act (IDEA). This was the same website that drew such concern for its disappearance shortly after Betsy DeVos, head of the department, took charge. Special education advocates were especially troubled about DeVos' possible attitude towards students with special needs after she fumbled questions related to the topic during her confirmation hearing. The department was quick to assure the public that the previous site had gone down due to server glitches. Since February, the site has been undergoing a redesign, based at least in part on comments from 130 people who provided feedback during the design process. The new site went live June 1. Among the changes, according to the department: improved navigation, more "robust" content and better search. For example, feedback from users encouraged the department to keep statute and regulation search capabilities, but also to include a policy document search. The search was kept but also updated to highlight the most recent statute and regulations. The search also includes policy documents, such as "Dear Colleague" letters, memos and frequently asked questions. New resource pages are targeted to specific audiences, including families, educators and service providers and grantees. DeVos added that the department would continue "to improve upon the new site by seeking and incorporating feedback from IDEA stakeholders in the coming months." Those comments have been solicited through an article on the agency's blog site. While several current messages from users note slow downloads for certain pages and documents and at least one respondent said the site wasn't accessible enough, others are using the comment area to take DeVos to task for her focus on private school vouchers. The new IDEA site is located on the department's website here. Until the site has been finalized, the previous website is still live as well.